I missed attending our acquaintance party last year. The date was scheduled in time for our vacation departure and I also missed a bunch of doughnuts, lol. I’m excited to join this year, the date falls on where I’m so humanly idle. I’m sure this would be extra fun having to see new faces and meet new bloggers in town. 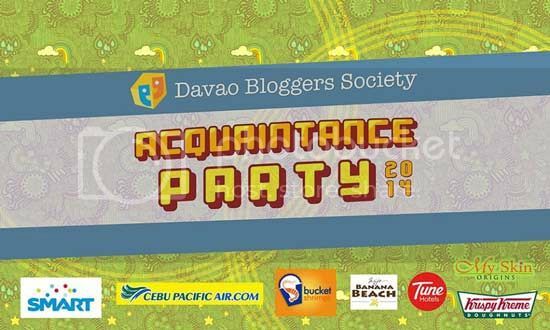 Bloggers around Davao region, if you happen to drop by and read this post, you are cordially invited to join us. No need to wear your tux and ties or your long gowns or your metallic night dresses jejeje although you can actually wear them if you have the courage to. Just come smartly with your awesome self and we’re good to have fun. Feel free to pre-register yourself on this doc http://goo.gl/5IzVAH who knows you’ll be the lucky one to win free flights courtesy of Cebu Pacific. And oh, wait, I heard there’ll be more exciting prizes to be raffled off. You can’t afford to miss this, right? An awesome kind of night will happen at 5:30 PM at the Bucket Shrimps Resto along Torres St., Davao City. See you!